The 2019 WWE Superstar Shake-Up has only featured one tag team splitting up so far, with SAnitY leader Eric Young moving to Raw by himself while Killian Dain and Alexander Wolfe remain on SmackDown Live. The rest of the new Raw recruits are as follows: AJ Styles, The Miz, Ricochet, Aleister Black, Erik (Rowe), Ivar (Hanson), Andrade, Zelina Vega, Rey Mysterio, Lars Sullivan, Jimmy Uso, Jey Uso, Naomi, EC3, Lacey Evans, Eric Young, Cedric Alexander. It is uncertain what the future holds for Young as a singles competitor on the Raw roster, while only time will tell if Dain and Wolfe will keep the SAnitY tag team going on SmackDown Live. Nikki Cross’ future is also up in the air. The fourth member of SAnitY, who is also Dain’s wife in real life, has appeared on both Raw and SmackDown Live since joining the main roster from NXT in late 2018. She did not appear on Monday’s Raw, which presumably means she will join SmackDown permanently, but it is not known if she will reunite with Dain and Wolfe. 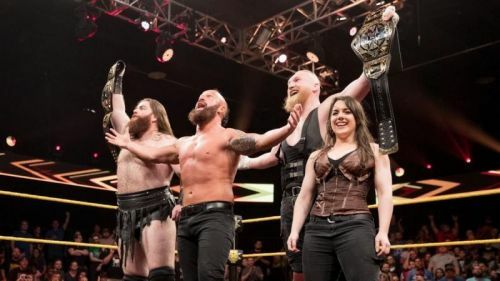 In this article, let’s take a look at four theories why WWE decided to split up the former NXT Tag Team champions. #4 Better as singles Superstars? Until Killian Dain and/or Alexander Wolfe appears on SmackDown Live, nobody will know exactly what plans WWE has for the two remaining SAnitY members. Dain was previously given a short run as a singles competitor towards the end of his time in NXT in early 2018, while he also took part in the Andre The Giant Memorial Battle Royal at WrestleMania 33 in 2017. Perhaps WWE has decided to let the trio split up in order to try them all out as singles Superstars instead.